Riot Have a Great range of Affordable touring Kayaks, sea kayaks & Whitewater Kayaks. Riot Kayaks are made from quality High Density Polyethylene (HDPE), offer great performance on the water and are cheap, affordable ways to get onto the water. 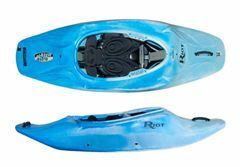 The Riot Mako 10 is a fantastic and affordable pedal drive sit on top kayak ideal for kayak fisherman. The Impulse Drive is much faster and more efficient way of traveling on the water. The Riot Mako 12 is a quality pedal drive sit on top kayak that is cheaper than most other pedal drive kayaks on the market. The mako 12 offers an briilaint impulse pedal drive and comfortable seat making the mako 12 an unreal kayak for a great price.